The LUSSO Collection now has two homes in the Abaco Club on Winding Bay in the Bahamas. This is proving to be a popular destination for several destination clubs. This new oceanfront cottage has 4 bedroom, 5 bathroom and sleeping for 10. As with all LUSSO homes it offers a gourmet kitchen and custom-designed furnishings and also has large porches and spacious verandas overlooking the ocean. Members of LUSSO can start making reservations now and the home will be available from mid September. The Abaco Club is an exclusive Golf and Sporting Club set on a 550 acre peninsula on Great Abaco Island. In addition to golf on its Scottish style tropical links course it offers tennis, horse riding, fishing, boating, snorkeling and a full spa and fitness center. For smaller guests there's a childrens club with a whole range of activities to keep the kids entertained. The resort is managed by Ritz Carlton and was developed by Peter de Savary. LUSSO has had a 3 bedroom home at the Abaco Club for quite a while and this has clearly proved popular with members, hence the addition of this new home. 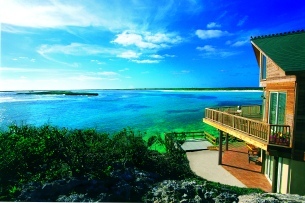 Overall The Abaco Club is very popular with the destination clubs. Ultimate Resort, Private Escapes, Exclusive Resorts, and The Oyster Circle all have homes at the Abaco Club. Solstice has it's own yacht, Solstice I which is based in Nassau, the capital of the Bahamas, during the winter months.